When Orcs Must Die! 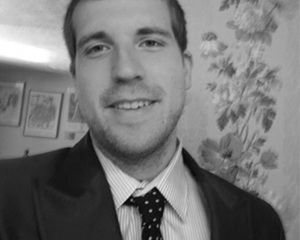 came out a year ago, it felt necessary to explain the tower defense genre. 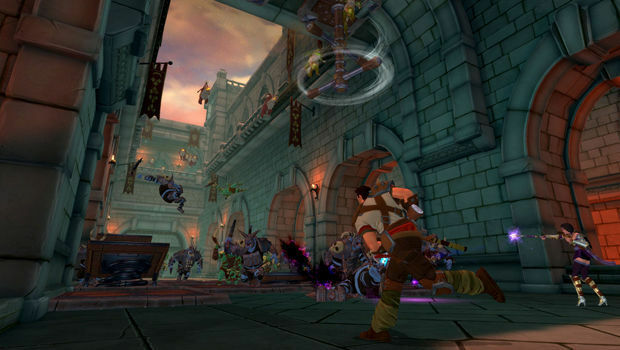 Now that Orcs Must Die!, Dungeon Defenders, and other games have changed the genre rules, I’m not sure if this is any longer necessary or even helpful. What you do need to know is that Orcs is among the best of the genre. It is as addicting and fun as PixelJunk Monsters and Plants vs. Zombies without imitating either. This sequel, released a scant nine months later, only builds upon the strengths of the original. Given the brief development of this follow-up, players wouldn’t be wrong for curbing their expectations before jumping into Orcs 2. This isn’t a sequel that drastically changes the visuals, mechanics, or setting. However, it is a sequel that addresses nearly every complaint lodged against the original and comes close to perfecting what was already one of the best games of last year. Everything from more customization to co-op make this a superior game. I personally prefer the first game’s levels, but even those can be played via DLC (free to those who previously purchased the original on Steam). Whether you play solo or co-op, you’ll be grateful for the changes made to the spellbook. 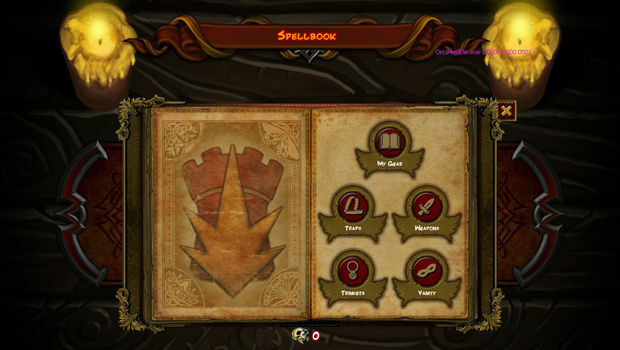 The spellbook is now divided into different sections for weapons (now upgradable), traps, trinkets (providing passive and active buffs), and costumes (the dead end for those who have unlocked all else). You can upgrade each item up to three times, give it buffs, and add new abilities (for example, gain the ability to use wall arrows on the ceiling). You can invest so heavily in one item that you won’t be able to see as many traps and weapons in action this time. This is both a good and bad thing, depending how you look at it. If you want to see everything the game has to offer, you’ll need to play a lot more of it. On the other hand, players now have a good incentive to keep playing after finishing the story. Even when you max out all of your War Mage’s items after beating Nightmare mode, you can do it all over again with the Sorceress. The game’s clever additions don’t stop there. Returning fans will be happy to find that the crossbow is no longer forced into the loadout and that skulls can be fully refunded at any time. This gives players the freedom to experiment and try new traps out. There are a lot of great additions to the arsenal that you won’t want to miss out on as well. I spent the majority of the game with the blunderbuss (a shotgun with a serious wallop), ice amulet, wall arrows (which now slows enemies when upgraded), boom barrel dispenser, and coinforge. 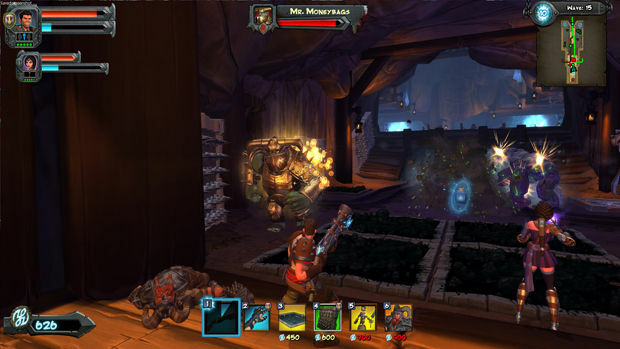 You’ll find your favorite loadout available from the previous game, which includes items featured in the Lost Adventures DLC. You’ll also find new items like the bone amulet which does major damage to a line of orcs. It also summons a bone golem. Or you can get physical with the dwarven hammer that deals major damage up close. Then there is the polymorph ring that turns the Sorceress into an ogre. There's too much new stuff here to list, but it’s all useful and fits the game perfectly. One minor frustration some players may have is that it’s hard to properly spec your character for both single-player and co-op. You’ll inevitably end up leaning on your partner for some abilities, but you’ll find yourself in a pickle when you play offline because of it. This is hardly a complaint though, especially with the refund skulls ability. If anything, it highlights how the co-op demands players to work in tandem and strategize together. I played the entire game co-op with Destructoid’s Holly Green and didn’t regret it one bit. With her Sorceress, she was able to deal damage from afar and apply the Ice Vents unique to her character, while I would ran headfirst into enemies and set up guardians at choke points. If you are worried the game won’t play the same with co-op: don’t! If anything, you’ll be missing your partner when you play offline. Orcs had a pretty rough end. The same is true in a narrative sense with Orcs 2, but it was the lack of progression that really made original end so abruptly. There wasn’t much else to do. Orcs 2 fixes this with endless mode, more unlocks, leaderboards, and a new skull system that will sink its hooks into you. Whenever my co-op partner wasn’t online, I’d replay previous story levels and get five skulls on them. If you play on War Mage difficulty, you’ll be able to obtain five skulls on levels: 4 skulls for not letting a single enemy into your rift and 1 skull for making the stage’s par time. It’s easy to manage at first but becomes increasingly difficult as you reach the insane later stages. There are also occasional skull drops that you can pick-up from dead enemies. As long as you don’t completely fail a stage, you are always making progress in Orcs 2. I didn’t play with the Sorceress until I already beat the story on War Mage difficulty, but I kind of wish I had chosen her from the start. Her staff is the best weapon in the game because it is capable of a variety of attacks. You can rapid fire it from afar with great accuracy, charge it up for an explosion, and use the alternate fire to charm enemies, making them attack other orcs. She also has a couple trinkets and traps specific to her. I can see myself playing the game all over again with the Sorcerress, since her speed, unique abilities, and arsenal give her a somewhat different feel. Although players can play as the same character in co-op, I highly recommend taking advantage of each character's abilities. Orcs Must Die! 2 is less Half-Life 2 and more Doom 2 when it comes to sequels. Its level design isn’t quite as good as the first, it doesn’t take any bold strides in storytelling -- though the dialogue is consistently laugh-out-loud funny -- but it perfects the original’s formula while adding some welcome additions to the series. Whether you are playing the story solo or going up against the never-ending horde in Endless mode, it’s easy to lose many hours to Orcs 2, especially when it offers so many incentives to keep playing. 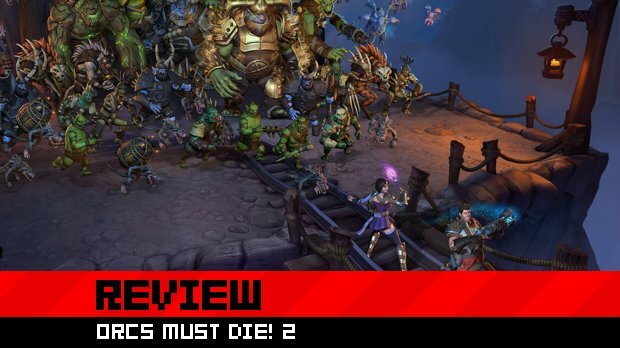 A year ago, I couldn’t imagine another game mixing tower defense and third-person action as well as Orcs Must Die! Clearly, I was wrong.